They use no white sugar, and they can easily be made gluten-free, too. Like many families, we try to minimize the amount of processed sugar we eat. But, it is lurking everywhere, and we are eating far more processed sugar than our grandparents did. How to combat this trend that seems to have sneaked up on us? A few ideas: First, let’s read the ingredient list and nutritional information on labels of every single food item we put in our carts. That sounds like a lot of work, but as we get familiar with our favorite foods, the task will become less daunting. But we need to know exactly what is in our food, and you might be surprised by what “healthy-sounding” foods have processed sugar or other weird ingredients and chemicals hiding in them. Remember that sugar can have lots of different names, such as “syrup” or “sucrose” (the suffix “ose” usually means sugar), so the sugar gram count can be helpful. Second, buy more foods without labels. When we buy whole foods and then cook them ourselves, we know exactly what is going into them. Third, favor sugar from natural, unprocessed, whole sources. While fruit-sweetened foods still have sugar, it’s not a highly-processed derivative, and it brings with its sweetness a full set of other nutrients. Bananas, apples and dates bring vitamins, minerals and fiber along with their sugars. Try recipes using them as sweeteners. Last, keep production of treat items in-house, meaning make less-healthy items homemade, so you can control what goes in. Craving brownies? Make them at home, so at least you see exactly what is going into the recipe, and you can even search online for slightly healthier version if you want. At minimum, you’ll likely be skipping a host of flavors and preservatives than if you bought a store-made brownie sitting on the shelf for days or weeks. 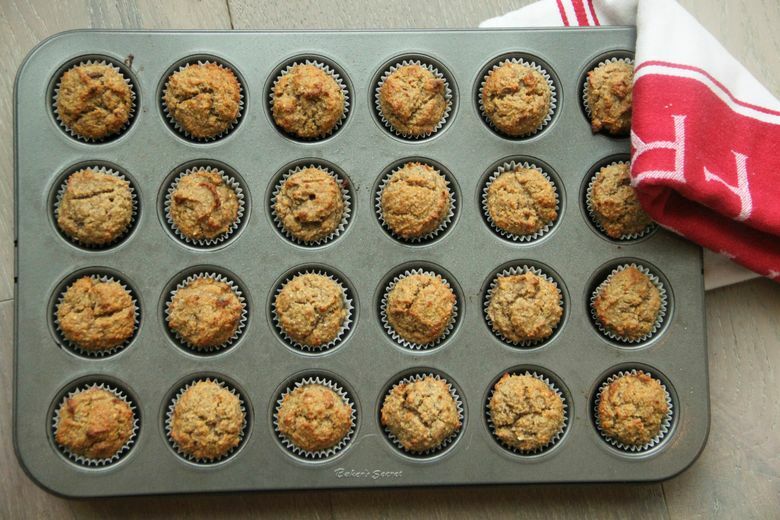 My banana oat morning mini-muffins don’t use any white processed sugar, and yet are just sweet enough to scratch the sweet-tooth itch. 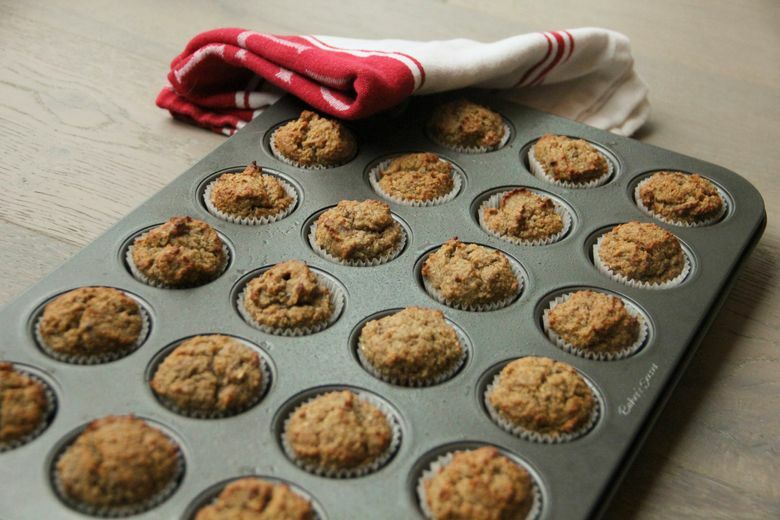 I usually bake a batch or two and freeze them for a quick breakfast or snack on-on-the-go, or to add a treat to their lunchbox or to a family Sunday brunch. They’re small so they thaw in minutes. 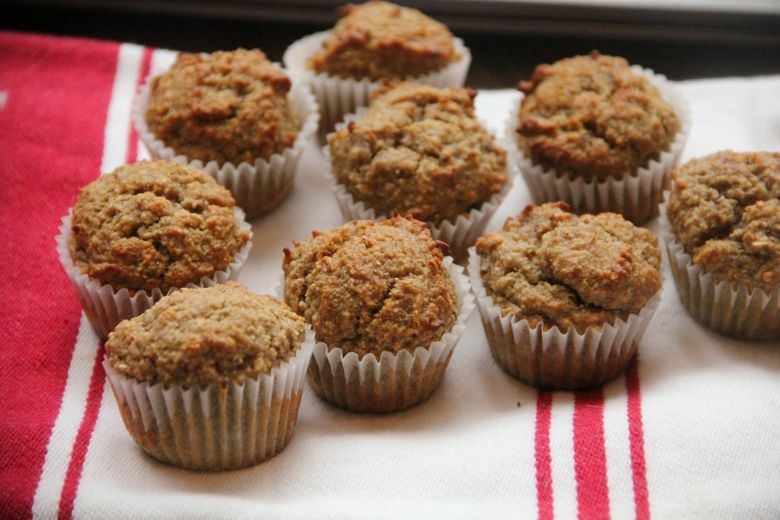 As a bonus for our family, I can easily make these little guys gluten-friendly for my intolerant daughter since there’s no wheat flour in the recipe — I just use gluten-free oats. 1. Heat the oven to 350 degrees. Mix the wet ingredients: Place the dates in a small bowl and pour ½ cup boiling water on them and let them sit for 5 minutes to soften. 2. Once soft, pour off the excess water (do not drain; leave them very wet), and use a fork to smash the dates gently into a loose paste. In a stand mixer using the whisk attachment (or hand mixer), mix the date paste, coconut oil and bananas on medium high speed until soft and creamy, about 2 minutes. 3. Add the eggs one at a time, mixing after each one, and add the vanilla. Prepare the dry ingredients: Place the oats in a dry blender or food processor and pulse until oats become a coarse powder. 4. Pour into a bowl and add almond flour, baking powder and soda, cinnamon, and salt and whisk to mix. Add the dry ingredients to the wet ingredients half at a time, mixing after each addition. If the dough becomes too thick for the whisk attachment, fold in using a rubber spatula. 5. 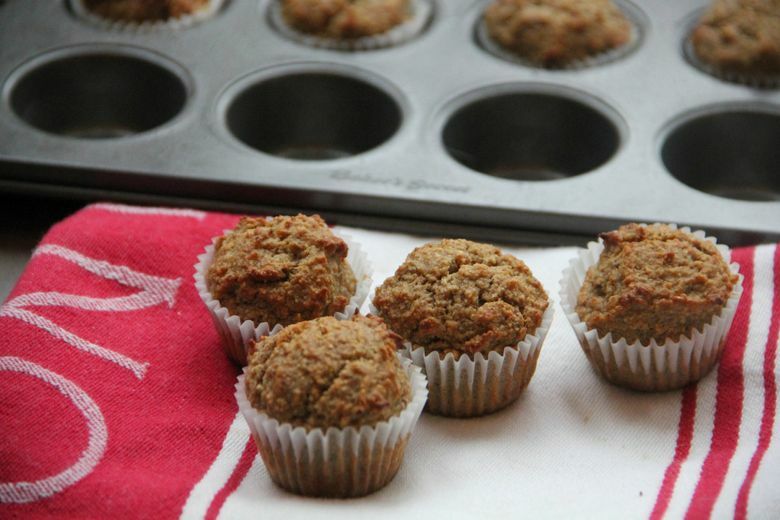 Use a small ice-cream scoop or a tablespoon to scoop dough into a mini-muffin pan fitted with paper liners. 6. Bake until muffins spring back to the touch, about 17-20 minutes.